Most Chinese markets and take-out restaurants sell some form of cooked Peking or barbecued duck. It's easy to call ahead and pick it up on the way home. 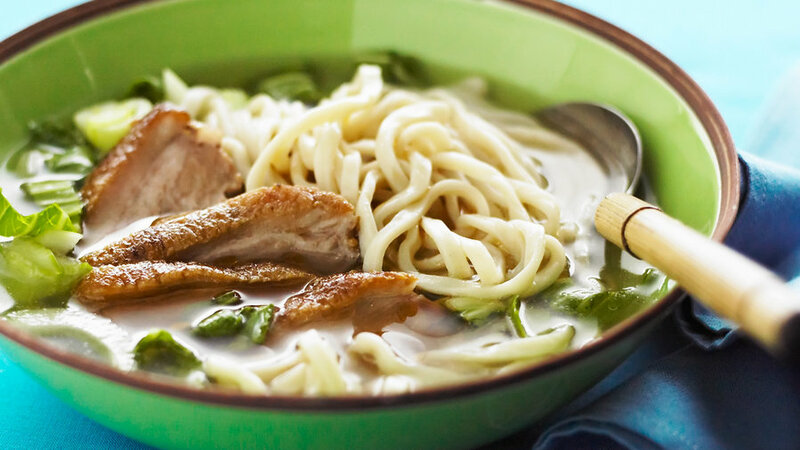 Then just serve it with a flavorful homemade broth and fresh noodles. Pair with: Bordeaux blend. The profile of Bordeaux grapes—dark blackberries, spice, pepper—loves spicy Peking duck. And the touch of aromatic Cabernet Franc in our bottle pick is a great foil for the ginger and sesame in the broth. Recommended bottle: Thomas Fogarty 2006 “Skyline Red” (California). Pair with: White Meritage (Sauvignon Blanc / Sémillon blend). In France’s Bordeaux region, a white wine is a mix of mostly Sauvignon Blanc and Semillon ― two grapes that balance each other well, the Sauv. Blanc bringing tart citrus and earthy minerals to the table, the Sémillon rounding them out with a little creaminess and sweet pear. As it turns out, the result tastes great with many Chinese dishes, including our favorite chicken salad. 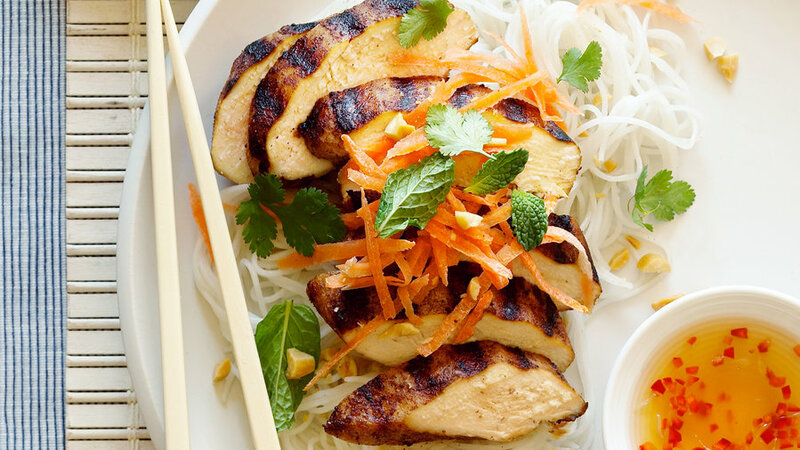 Like a cross between a noodle bowl and a salad, this dish is low in fat and has a kick­—thanks to the zesty salad dressing based on a Vietnamese dipping sauce. Pair with: Chenin Blanc. It sports some tropical flavors, exotic florals, and a tiny bit of residual sugar—all of which make it really good with spicy Asian dishes. Its beautiful acidity handles the zippy lime in the dressing here, while that exotic side is a good foil for the five-spice, mint, and peanuts. Recommended bottle: L’Ecole No 41 2012 Chenin Blanc (Columbia Valley). 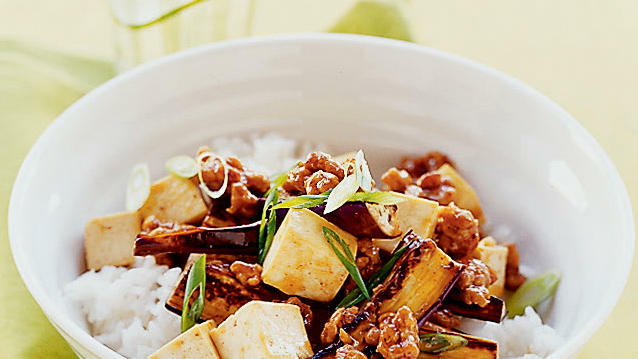 Spicy garlic sauce gives a big flavor punch to simple stir-fry in this Asian-inspired dish. Pair with: Riesling. A very slightly off-dry Riesling makes a great foil for the heat in many Asian dishes and maybe because of its rich mouth-feel and sweet fruit, Riesling has a special place in its heart for pork. Recommended bottle: Charles Smith Wines “Kung Fu Girl” Riesling 2007 (Columbia Valley). Pair with: Viognier. With its honeyed tropical fruit flavors and exotic floral notes, Viognier is very happy teaming up with coconut-based curries. And that sweet-seeming fruit, a great backdrop for seafood, makes it logical to give shrimp the lead role. Recommended bottle: Don & Sons 2011 “The Crusher” Viognier (Clarksburg). Brush salmon with a mix of spices and brown sugar, then finish in the oven 'til bubbling and well browned. Garnish with cilantro and lemon. Pair with: Merlot. 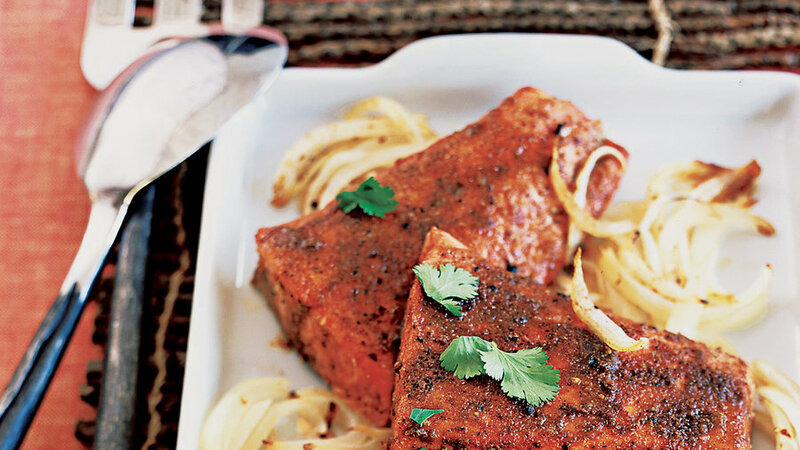 The sweet fruit and oak accents in the Merlot perk up with the touch of brown sugar in the rub on this salmon. And the coriander, cardamom, and cloves bring out a warm-spiced edge in the wine, which also throws a juicy, lively line to the crunchy onions with the salmon. Recommended bottle: Teira 2010 Merlot (Sonoma County). Big, bold Southeast Asian flavors team up in a perfect balance of salty, sweet, hot, and aromatic. Pair with: Chardonnay. 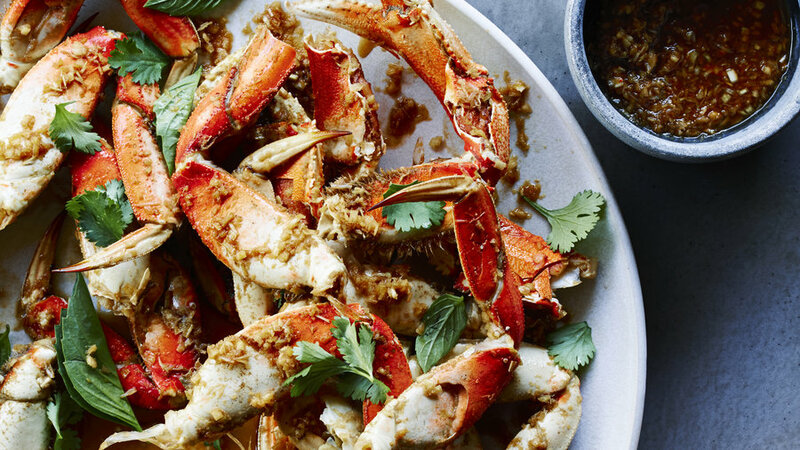 Crab and Chardonnay are one of the food-and-wine world’s greatest couples. Our bottle pick is minerally enough for some exotic seasonings. Recommended bottle: Schug 2010 Chardonnay (Carneros). There’s nothing like authentic tea-smoked duck, but the smoking process can overwhelm many home kitchens. Enter “smoked tea duck”—using lapsang souchong tea and uncooked rice to make a smoky, crispy crust for duck breast, which is then pan-fried in its own fat. Pair with: Pinot Noir. Duck and Pinot Noir make a special match, with the wine’s tart berry and cherry fruit working as foil for the meat. The tea here is meant to pull out the black tea in the wine. Recommended bottle: Hahn Winery 2011 Pinot Noir (California). Green curry can be quite spicy but it’s a great combo with a dense fish like mahimahi. Pair with: A sweet, exotically floral white blend. The mix of fruit flavors in a Chardonnay–Pinot Gris blend, for example, comes with the barest hint of sweetness that can handle the heat along with the herbal and sweet spices in Asian curry. Recommended bottle: 14 Hands 2010 “Hot to Trot” White Blend (Washington). Follow the recipe to make your own kimchi, or take a shortcut and use the condiment ready-made from the store. Pair with: Merlot. When it hails from eastern Washington, it often has a more savory, herbal quality than Merlot from California. Our bottle pick calls for a touch of brininess in its food partner, but it also has enough of that classic cherry-chocolate Merlot profile to handle a little heat in the kimchi here. 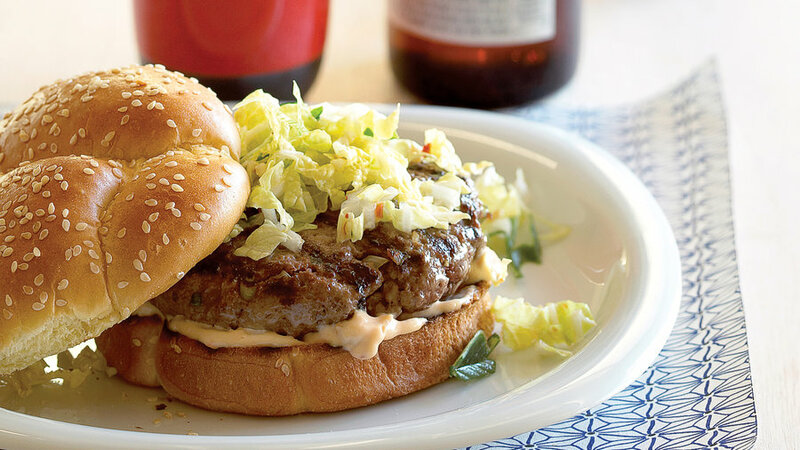 Bonus: a great matchup between the wine’s smoke and soy in the burger. Recommended bottle: Walla Walla Vintners 2009 Merlot (Walla Walla Valley). Day-old leftover rice gives this fragrant fried rice the best texture, but you can also make it with rice cooked and cooled the same day. Pair with: Brut Rosé. Sparklers take well to the sweet-sour tang of many Thai dishes. 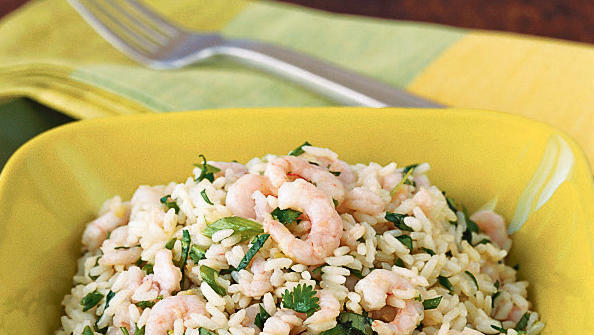 The wine’s tight bubbles come across as creamy, which is a good backdrop for shrimp and rice, and its crispness makes the fresh herbs pop. Recommended bottle: Montenisa NV Brut Rosé (Franciacorta DOCG, Lombardy, Italy). 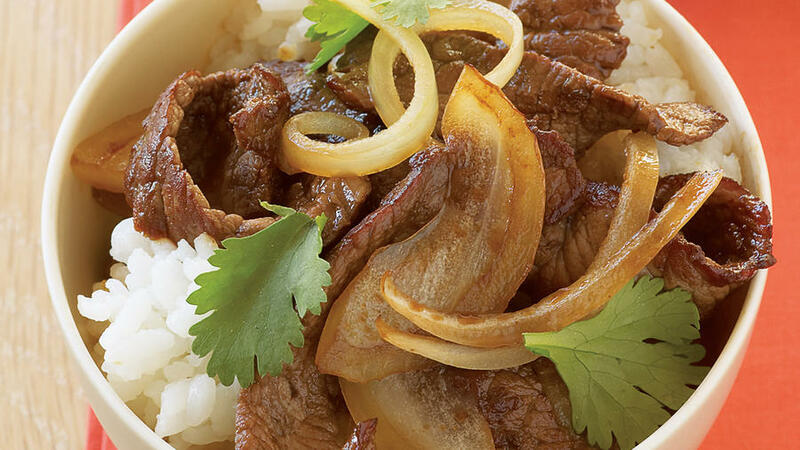 Beef and onion stir-fry gets a boost from a dash of sake and smattering of cilantro leaves. Serves over fluffy rice to soak up every last drop of the yummy sauce. Pair with: Meritage. With its multiple Bordeaux grapes, a Meritage has the advantage of what amounts to a whole spice rack of seasonings: black pepper, spicy licorice, dried herbs and fruit. That complex character loves the sweet-savory combo that is Japanese beef. Recommended bottle: Brothers Greene 2009 Red Meritage (Sonoma County). 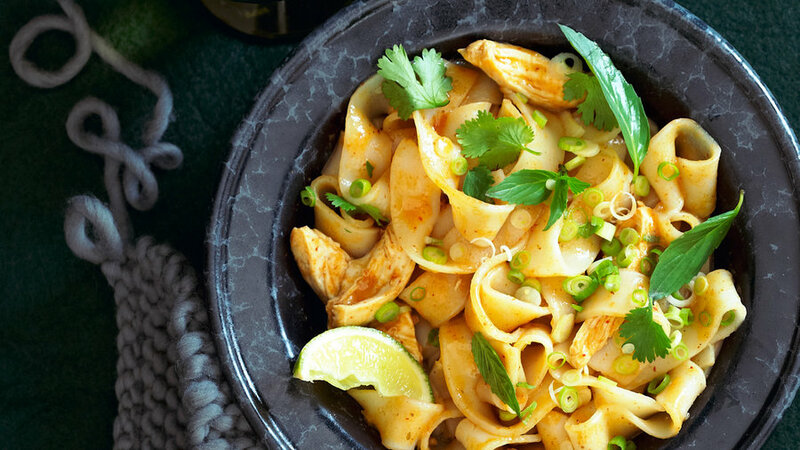 This is your go-to recipe when you need a chicken-and-noodle comfort food fix--with a kick. The secret ingredient is the curry paste, originally from Malaysia and now popular all over northern Thailand. Pair with: Pinot Gris. The pretty apple, pear, and honeysuckle in the wine use the coconut as a foil, while the curry brings out a little minerality in the wine. The spritz of lime in the sauce makes the natural citrus in Pinot Gris really sparkle. Recommended bottle: Boomtown 2010 Pinot Gris (Washington). Here we've fused classic Japanese flavors like ponzu and wasabi with Mexican-style tacos. Pair with: Pinot Noir. Don’t miss a chance to drink red wine with seafood! 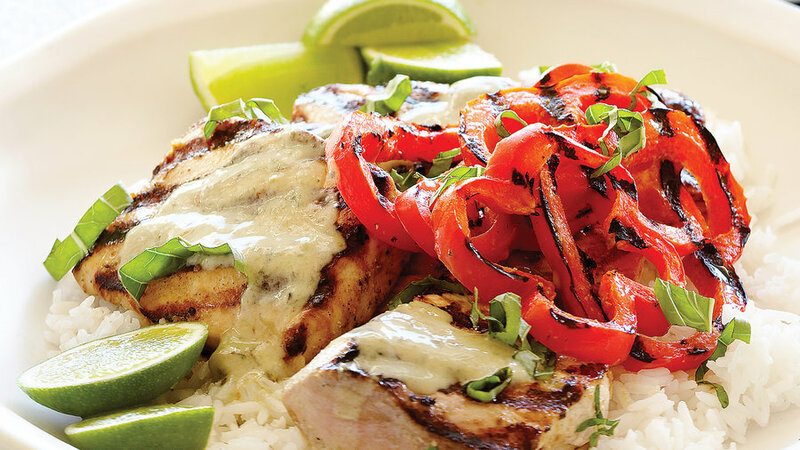 Pinot’s rich structure is a great match for meaty tuna—especially when the fish is tender and rare in the center. The tangy red berry flavors in our bottle pick play happily with spicy Japanese ponzu sauce. Recommended bottle: Daedalus 2007 “Labyrinth” Pinot Noir (Dundee Hills). Necessity is the mother of great inventions―definitely true when it comes to this tasty recipe, created by a cook in a hurry who wasn't willing to sacrifice taste. 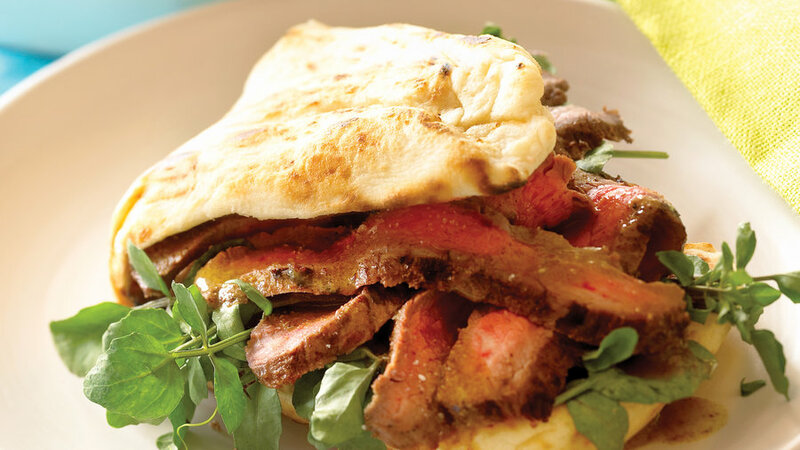 Pair with: Merlot, which works well with the earthy spices in Indian garam masala. 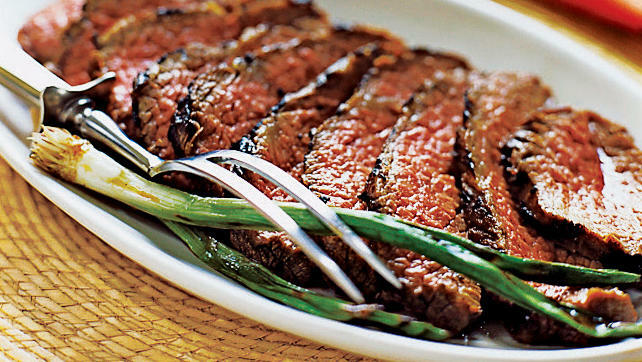 Plus its plum and dark chocolate notes love full-flavored flank steak. Recommended bottle: Barnard Griffin 2010 Merlot (Columbia Valley). Pair with: Merlot. 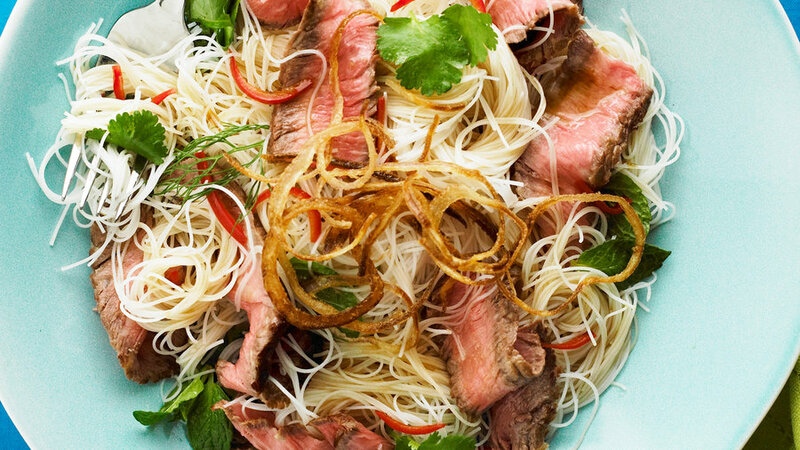 Salad and red wine don’t usually share the table, but Merlot loves fresh herbs and has a gentle texture that works really well with noodles—and, of course, steak. 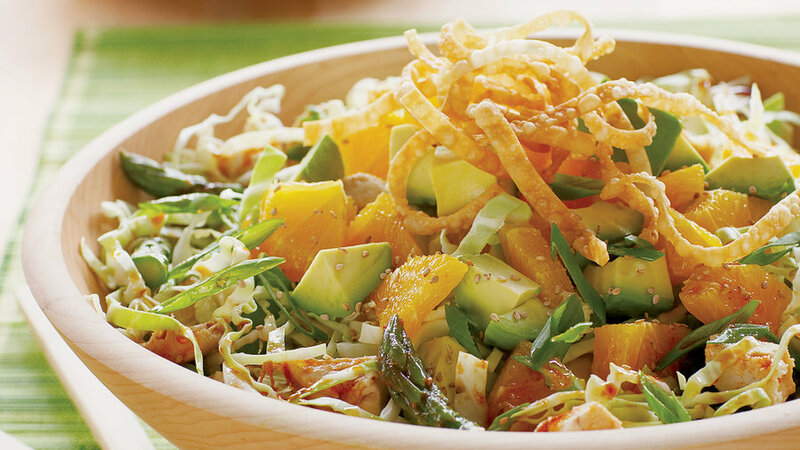 Our bottle pick has enough tangy acidity to stand up to a lime-based dressing. Recommended bottle: Double R Ranch 2008 Merlot (Napa Valley). 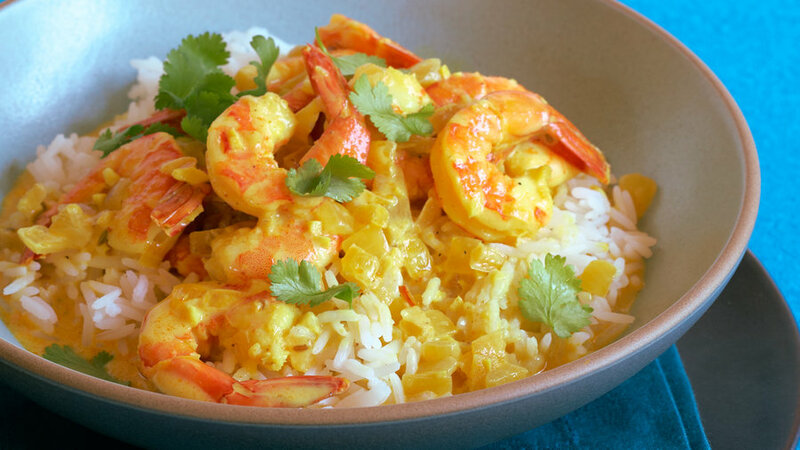 Serve this coconut milk-based curry over steamed jasmine rice. Pair with: An aromatic white blend. Perfumed aromatics call for exotic ginger and coconut. Some grapes in the blend are also great with sweet potatoes. Recommended bottle: Arizona Stronghold 2010 “Tazi” aromatic White blend (Cochise County). 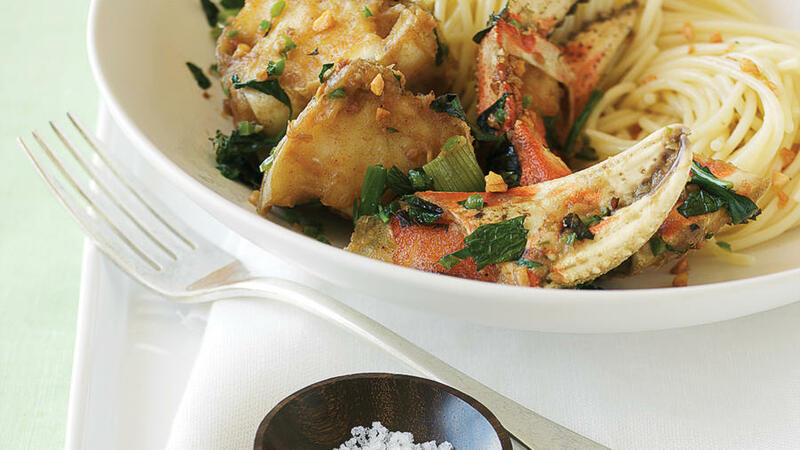 Sweet crab seems even sweeter when it swims up against the big flavors here: garlic, ginger, and hot red chiles. Pair with: Sauvignon Blanc. 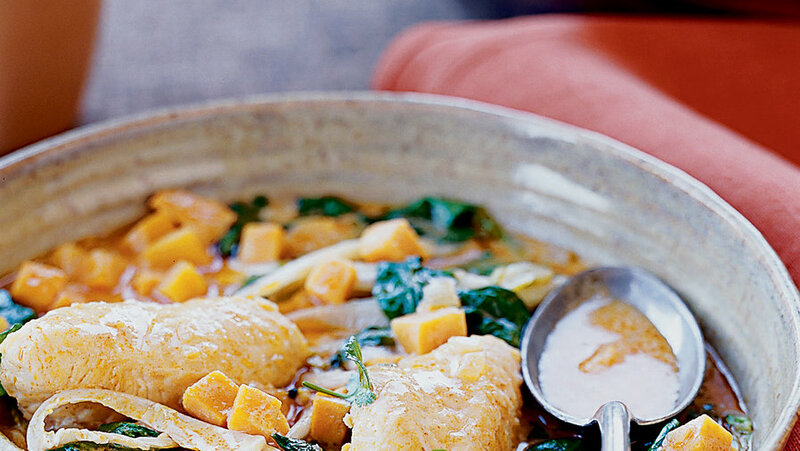 The exotic side of this variety loves the ginger and aromatic herbs in this dish. Our bottle pick even has an edge of green chile flavor to link to the dried chiles and serranos in the crab. Recommended bottle: Mount Nelson 2009 Sauvignon Blanc (Marlborough, New Zealand). 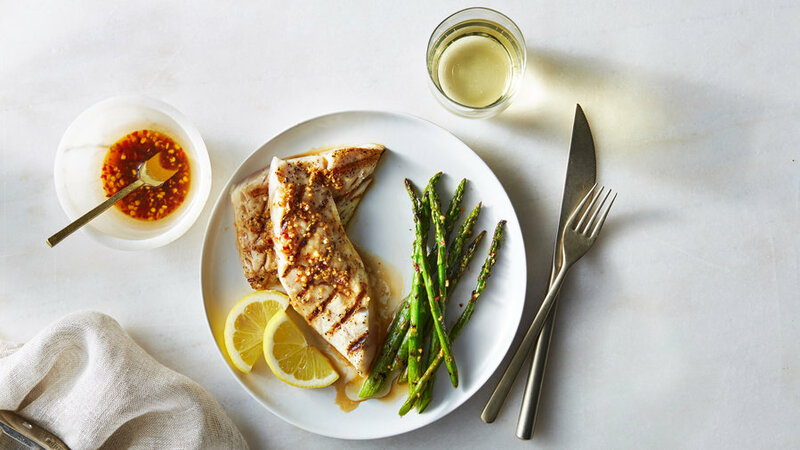 A sweet and spicy ginger sauce is drizzled over perfectly grilled rockfish and tender-crisp asparagus in this succulent recipe. Pair with: A floral white blend. Exuberant florals are looking for some exotic, tropical flavors in a match. Recommended bottle: Eberle 2009 Côtes-de-Robles Blanc (Paso Robles). 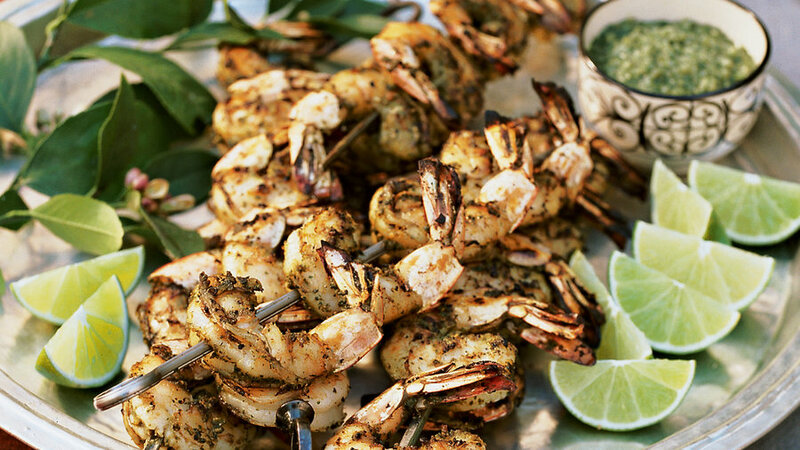 Grilled shrimp is given a makeover with this simple but delicious marinade. Pair with: Riesling. Few wines go with as many foods as crisp, aromatic Riesling does. The pungent herbs, garlic, chiles, and Indian spices here would intimidate most other varieties. Not a slightly off-dry Riesling, though, with delicate peach and apricot flavors and exotic floral aromas. 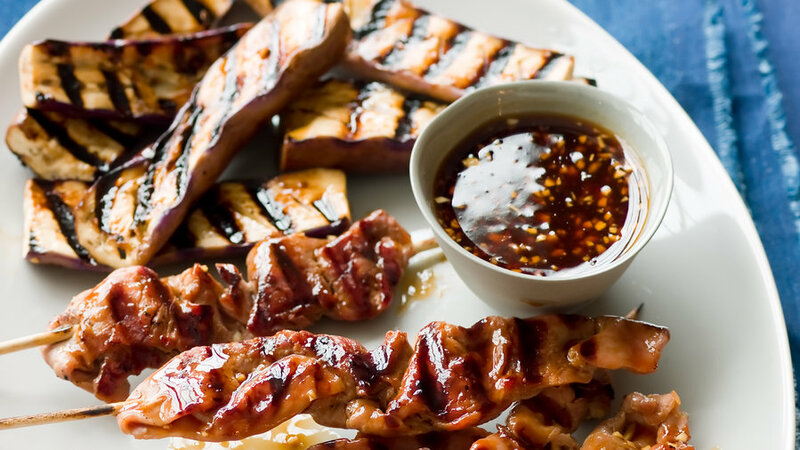 This teriyaki marinade does its magic overnight. Pair with: A Bordeaux belnd. 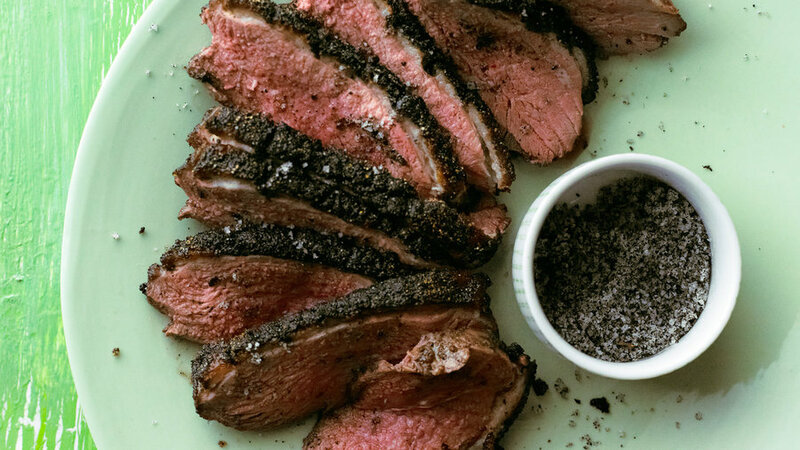 A blend of all of the traditional Bordeaux grapes (Cabernet Sauvignon, Merlot, Cabernet Franc, Petit Verdot, and Malbec) is on the dark and brooding side, pushing it toward hearty cuts of meat. Over the wine’s heart of darkness, though, is a layer of lush fruit that doesn’t mind that the marinade has a touch of sweetness. Recommended bottle: Hahn Meritage 2007 (Central Coast). These tender, sweet-spicy pork kebabs are made from pounded tenderloin and combine flavors from China and Vietnam. Pair with: A peppery Merlot. With a few years in the bottle, the tannins in our pick have softened to a silky level that complements pork and eggplant. Its pepper welcomes spice, and tobacco smoke makes the caramelization pop. Recommended bottle: Paint Horse 2005 Merlot (Sonoma Valley).